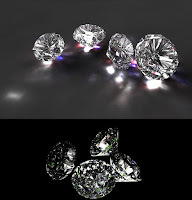 Rendering a realistic looking diamond in Maya is little bit trickier.In this tutorial I have used Mental ray for rendering but used default Blinn material for shading.I didn't used any lights,caustics,HDR map,final gather or global illumination for this scene.The final glow is achieved by After effects.In after effects I used Default glow because I want to show with in our limit we can make some thing good like this. If you have Sapphire plug ins or other After effects plug ins use it wisely for getting some real glows.I skipped lighting for this scene because the same reason, I want to show that it is possible in this way too.If you are capable of doing a studio lighting and caustics the final out will be awesome.Feel free to share your thoughts and comments. In order to get the real looking diamond you need to model it like the real Diamond.You need to make the cuts similar to the Real Diamond.This will ensure the correct refraction and reflection of visible light.Here I am using brilliant cut Diamond model. 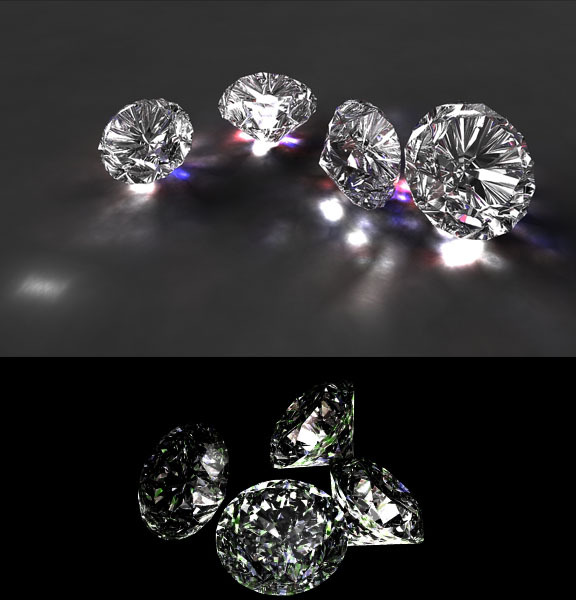 Shading the diamond with correct material is very important.If you are familiar with Mental ray material use mia material instead of Blinn and kill your time by tweaking it.In this video I am showing some tricks to achieve the look of diamond with Blinn. Experiment with different settings you can get much better render.Use lights only after completing the tutorial because in this scene I didn't use any lights at all. If you add studio lighting and shadows, you will get photo realistic rendering. But I just used default light here. I have used After effects for compositing.You can use your favorite compositing software like fusion,nuke etc.If you use commercial plugins like Sapphire the glow will be much sexier than this video.It is up to you how you improvise.For this I rendered out JPEG sequence with a turntable camera. (I skipped that portion in the tutorial). from where did i get the diamond 3d model..anyone plzz????? Why are you trying to model it your self? There is the modeling tutorials!!! Anyway we are adding more 3d meshes for free download. We will add diamond model also. can u please upload a tutorial on getting the caustics as seen in your final output. it would be of great help. please.